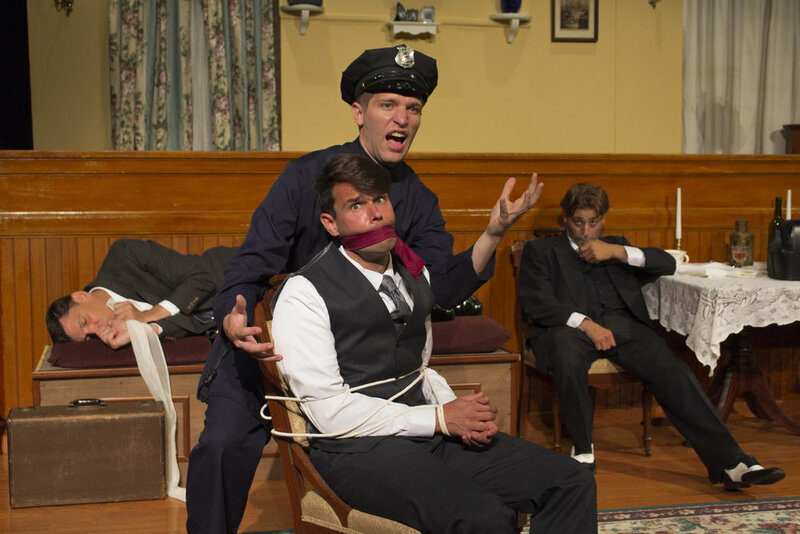 Scott as Mortimer Brewster in ELTC’s Arsenic and Old Lace, finally forced to listen to the plot of the play written by Officer O’Hara (Kegan Witzki), instead of being rescued from his brother Jonathan (Paul Battiato) and Dr. Einstein (Morgan J. Nichols). Photo by Michael Beebe. Scott as Harry Trench and Madeleine Farrington as Blanche Sartorious agree to marry, no matter what their families might say, in Widowers' Houses at Washington Stage Guild. Photo by C. Stanley Photography. Scott As Brad Majors with Connor Lyon as Janet in TUTS's production of The Rocky Horror Show. Photo credit Theatre Under The Stars. Scott dancing with Annemarie Rosano during a medley of “I Won’t Dance”, “Pick Yourself Up” and “Look Who’s Dancing” in ELTC’s On the Sunny Side of the Street. Photo by Michael Beebe. "You Gotta Look Out For Yourself"
Scott as Jimmy Powers with the Angel City Four in NextStop Theatre's production of City of Angels. Photo by Traci Brooks. Scott as Dad celebrates rescuing snuffle bunny from the washer in Adventure Theatre MTC's production of Knuffle Bunny: A Cautionary Musical, with Emily Zickler as Mom and Suzanne Lane as Trixie. Photo credit Adventure Theatre MTC. "The Time You Spend With Me"
Scott singing Joe Maloney's "The Time You Spend With Me" with Lisa Michelle Wyner at the Dramatists Guild Fund with La Ti Do NYC. Scott as Billy Crocker in GG&SS's production of Anything Goes, with Joe Anderson as Moonface Martin and Jeanette Thurber as Reno Sweeney. Scott as Mortimer Brewster in ELTC’s Arsenic and Old Lace, teasing his soon-to-be-fiance Elaine (Jennifer Flynn) before realizing his life is about to turn upside down. Photo by Michael Beebe. "Life is Tricky With Trixie"
Scott as Dad with Suzanne Lane as Trixie in a production shot from Adventure Theatre MTC's production of Knuffle Bunny: A Cautionary Musical. Photo credit Adventure Theatre MTC. "Walkin' Dad With His Girl"
Cokane (Michael Glenn), Sartorious (Lawrence Redmond) and Lickcheese (Steven Carpenter) gang up on Harry Trench in Widowers' Houses at Washington Stage Guild. Photo by C. Stanley Photography. Scott as Harry Trench shares letters from "the principal members of his family" approving of his engagement to Blanche with Mr. Sartorious (Lawrence Redmond) as Cokane (Michael Glenn) looks on in Widowers' Houses at Washington Stage Guild. Photo by C. Stanley Photography. Publicity shot for Merrily We Roll Along. Scott singing in Journeys, a benefit concert for Loudon Interfaith Relief. Scott as Jeff in [title of show], with Josh Goldman as Hunter. "This is 1968, dearies, not 1948!" Scott as the Strongman and the cast of Creative Cauldron's Madeline and the Gypsies listen to Laura Connors HUll as the Gypsy Mama. Photo by Gary Mester. Scott ponders the foibles of love in “A Fine Romance” with the cast of On the Sunny Side of the Street at ELTC (Joilet F. Harris, Annemarie Rosano, Melissa Zimmerman). Photo by MIchael Beebe. Scott and the cast of On the Sunny Side of the Street (Joilet F. Harris, Melissa Zimmerman and Annemarie Rosano) at ELTC, during “The Rhythm of LIfe” from Sweet Charity. Photo by Michael Beebe.